Greetings from Philly! I packed the above outfit to wear while traveling but between the chilly morning and the predictable A/C on blast I opted for jeans and a cute tee. I’m visiting my family and running a few wedding errands this week but I wanted to check in and share some of my favorite finds from my most recent LOFT haul. They currently have 40% off everything and a flash sale for 60% off sale styles. My latest online order wasn’t a winner since I only kept two pieces mentioned below but that means more money that I can put towards other things I really love. Fit: Fits true to size but the waist fits bigger per the measurements below. Love and would recommend. I ordered this and the mixed cotton eyelet dress to compare but this dress was the clear winner. The thicker material, eyelet and scallop details made it look more expensive and better quality while the other one was too thin, see through and a bit shorter for my liking. I think this dress looks best when worn alone due to the pleats at the hip which can make you appear wider. I threw on the cardigan for church because I packed a little too light and didn’t have anything else that matched better. Fit: True to size to one size larger. This is a relaxed fit cardigan more suitable for casual wear. If you want to wear it for more dressier events over dresses then you may want to consider ordering one size down. Love and would recommend. The pretty eyelet details on the sleeves caught my eye and I was going to order it in white but I tried the rainwash blue which looks more like a pastel mint color. The fabric is very soft and smooth to the touch. 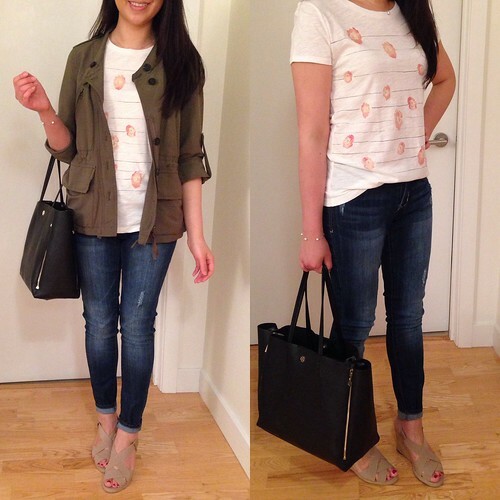 Lou & Grey Mesa tee – Petite-friendly fit in sizes XXS and XS. Note: This tee is not part of their current sale but I’m keeping this in my cart/wishlist! As seen on Cee Cee Wong here. 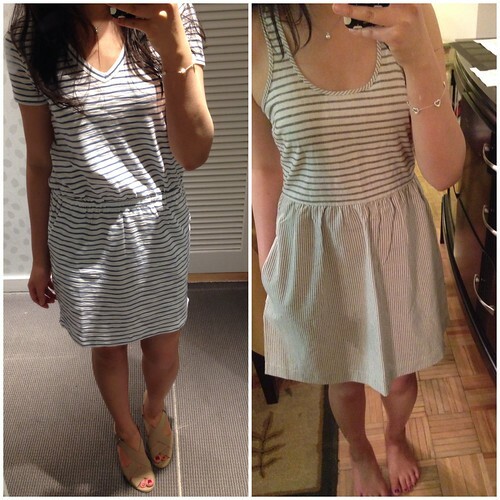 Lou & Grey Stripe Tee Dress – See it on me here. Trying size XXS, the drop waist didn’t do anything for my figure but it’s worth trying on if you have a lithe frame and less hips. Lou & Grey Stripe Mix Dress – See it on me here.Trying on size 00, it’s a racer back style with an exposed zipper so I returned but it’s really cute, well made and easy to throw on under a denim jacket. Mixed Stripe Pocket Skirt – XXS regular runs large and fits like size XS or S. Beautiful thicker jersey material and it has pockets! Chambray Sleeveless Shirtdress – I ordered this in 0P but it runs big (fits like a sack) and the unexpected drop waist with the tie-sash is not flattering. It doesn’t look like the online stock image and I was really disappointed. Modern Skinny Ankle Zip Jeans in Grey Pinstripe – I reviewed these jeans in my last review here and I’m sad to report that they stretch out horribly. I’ve shrunk them a second time but I have yet to wear them again to see if it sticks this time after drying them on high heat a full 40 minutes. I also popped into Banana Republic after church yesterday after not shopping there for months. I was pleasantly surprised to find that they brought back my favorite maxi from two years ago which I have in navy. I wear it to death more than I care to admit. This year’s maxi dress is now a petite-friendly length with no hemming required (it falls about 1″ above the ground on me). 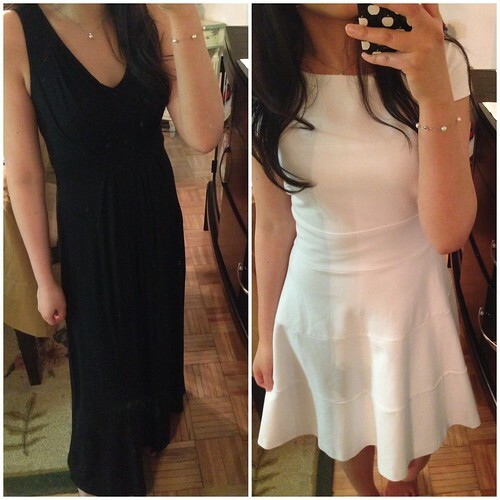 I also found the white dress recommended by Annie which runs small despite the stretchy material so I sized up to a 4P. Lastly, I spotted a 00P of the Marimekko Collection Kivet Full Skirt in store (it must have been a return) so out of curiosity I tried it on. It fit comfortably high on my waist so I’d say it runs big because my waist currently measures 27-28″. See it on Wendy here and Vicky here. Sorry I don’t have any pictures to share because my mom was using my phone to play Candy Crush.